Yes, yes I really have been working on a few projects since my last update. 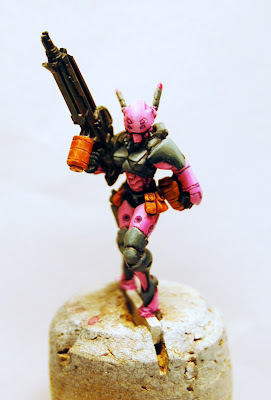 So for my pink gunner here I'm thinking about picking up some bases from Dragon Forge. But I need to finish painting her first. 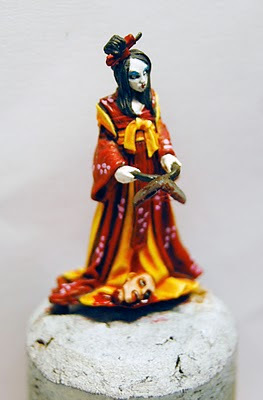 Now this figure from Malifaux I actually bought it because it inspired me to make a base for her. Jason was kind enough to take over the basing for me after we drew up a few ideas. So now the stone steps have been made and the Torii is half way finished. We just need to sprinkle some more rocks on it, add a few coats of paint and snow and it will be ready to go. This year I've decided to only paint minis for fun and not for an army or any sort of game. I'm not going to paint another Sister of Battle until a new box set and Codex comes out for them (I hear rumors but we shall see). I held out for 10 years (and got a half assed codex in the middle) then painted for 1 year. I think I can hold out again for a little while longer. 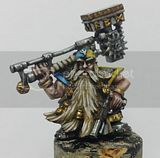 So until then there will probably be a lot of crazy minis posted here and not very much WH (unless something comes along that looks totally fun to paint). What are your painting goals this year? Fun, Army Building, Poo flinging, etc? ?